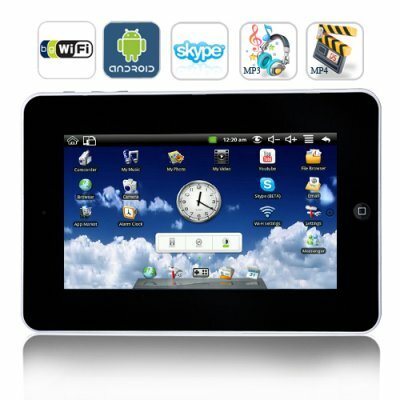 Successfully Added 7 Inch Android Tablet with WiFi and Camera to your Shopping Cart. A portable experience like no other: Everything just became a lot easier with this 7 Inch Android Tablet. Browse the internet using WiFi, watch videos on YouTube, read ebooks, send emails, chat over Skype, play your favorite games - do whatever you want, when you want. Along with the 800x480 resolution 7 inch touchscreen, the details just looks better and the pictures smoother - a true feast for your eyes. Gain access to everything: Haven't heard of Android? It's only the most popular operating system in the world and includes true multi-tasking, widgets, and many more features that can't be found anywhere else. Best of all, this 7 Inch Android Tablet comes installed with convenient applications such as email, YouTube, Skype, MSN, and of course an App Market, which is home to tons of third-party applications ready for you to download. High quality, low price: This affordable 7 Inch Android Tablet is the best bang for your buck today and brought to you at a factory-direct price that can't be matched. How do we do this? By cutting out the middle man and selling to you factory-direct with no markup and no extra fees! Why wait for the Samsung Tablet and iPad 7 inch version when you can get this 7 Inch Android Tablet now, and at an amazing wholesale price! Yes! Everything you see is everything you get! This is a true Android 7 Inch Tablet with WiFi, YouTube, front facing camera/camcorder, Skype, MSN, and so much more!